Qi Gong – What is it and why do it? A while ago a friend showed me some QiGong (aka Chi Kung) and manipulation of energy and I was very impressed and excited by what I had seen, particularly as I have been looking to add an active meditation to my range of meditations. Qi Gong has been a very powerful influence in his life, helping him to beat a downward spiral of drug addiction, and also helping him to attain new levels of spiritual understanding and awareness. Unfortunately there are no Qi Gong teachers local to me, so when I found an online course by a well respected QiGong teacher I decided to give it a go! It’s 22 week online course that I’m very enthusiastic about, so I thought I’d write a little blog post about it and keep you updated as the course progresses! QiGong is an ancient Chinese form of active meditation. It is very similar to practices such as Tai Chi (although much easier to learn!). It is part of Chinese medicine, other aspects including Chinese herbs and Acupuncture. So put that together and you have Energy Work. What does that achieve? Well I’ll go into more detail shortly, but first, why practice something like QiGong? QiGong brings extra benefits, as explained by Marcus, my online teacher for the next 22 weeks – a sincere seeming guy who has been taught by masters in China and practicing for over 10 years. 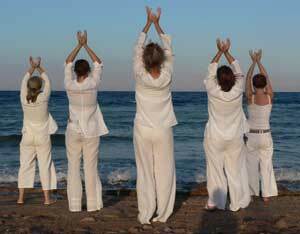 So what are the extra and specific benefits of practicing Qi Gong? To expand your mind – like with any good meditation practice, it can help improve your memory, creativity, intelligence, awareness and your ability to articulate your thoughts. To take you further on your spiritual journey – meaning to help get you in touch with your inner self, but also with the universe, other people, and understanding and enjoying your place within that. Chinese and Japanese medicine and in fact most alternative forms of medicine believe that we have energy lines or meridians flowing through our bodies. If these flows of energy become blocked, many unfortunate things can result, from emotional conditions such as depression, to physical illnesses and dis-eases. Energy work keeps us healthy and happy and is the key to almost all alternative forms of medicine I have come across, including Reiki, a form of healing I am passionate about. Ok well that’s enough for now, so far I’m really impressed by the info and explanations that Marcus has provided about Qi Gung (there’s written material and videos for each week) and I’m off to practice the first form of the course which is called, most poetically ‘Butterfly dancing in front of Flowers’. This form is all about opening your heart and body. Do you or have you practiced QiGong? Is is it something you are thinking about? Why not join me on my journey and we can learn together! If you are keen to learn more about the course Marcus is offering, you can try a two week trial of QiGong and see what you think! Still it could be coincidence that the only pneumonia vaccine ever administered to me was just prior to my developing a full blown case of pneumonia. or next nothing, the time to act is now.